Oliver enjoys being on his own and has lots of adventures with his imaginary friends. However, there are some things he has to do on his own as his imaginary friends can’t join him. One day, he loses his tennis ball and this leads him to meet someone else who was a bit different too. This book about not fitting in and being different to those around you celebrates this fact and shows the joy to be found in imaginative, solitary activity. In this sense, the book takes a somewhat different perspective to other texts on similar topics. However, while the pleasure of this is acknowledged, so too is the loneliness. The comfort and reassurance of finding someone else who is “different” too is emphasised at the book’s conclusion, when Oliver finds a female friend, extending the experience of feeling different to girls too. 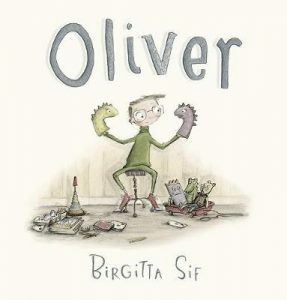 A further interesting feature of this book is that it does not suggest Oliver is on the autistic spectrum, as many books about children preferring solitude appear to suggest.